Now With More Future, Less Rama! "Robot Robin Hood" is the twenty-fifth comic issue, which was released 24 May, 2006 in the US. Bender and Fry are playing in the holo-shed, imagining that they are saving Ed Sullivan's head from four insects called The Beetles. Leela interrupts, claiming they are under attack by a group of four flies. While trying to defeat the flies (who want in on Planet Express' shipment of manure), they damage all their working thrusters and are soon plummeting towards a class M planet. When they crash, they are invited to a peasant's house for supper. While there, the tax collector arrives and tries to take all their money. Leela scares him off, however, since it means the peasant's lives are now in danger, they must leave. While walking aimlessly around the planet, Bender decides to take up pickpocketting, and after a twist of fate in which the peasants get their tax money back, he becomes known as Robot Robin Hood. Leela tells Bender she needs some new parts to repair the ship so that they can fly back to Earth. Bender takes Leela and Fry to the Sherrif of Bot-tingham's castle that night, where they find money as well as the parts they need for the ship. The Sherrif arrives and finds his possessions missing. Upon discovering a bow and arrow Bender left behind, he starts an archery contest in hope of capturing Robot Robin Hood there. 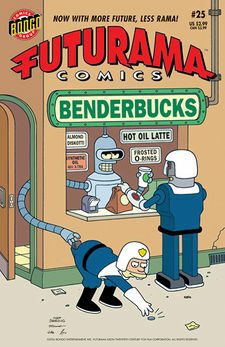 At the competition, Bender replaces himself with the real Robin Hood, however, Bender and his gang are still captured. Just as they are sentenced to death, King Richard the Linux-Hearted arrives and tells the Sherrif to pardon their lives. King Richard then holds a feast in their honor. Zoidberg, once again, arrives on the planet solely to eat. The Holo-shed is mislabled Holo-deck. The Beatles: Songs referenced include Twist and Shout, A Hard Day's Night, Help!, Maxwell's Silver Hammer, Magical Mystery Tour, Drive My Car, Octopus's Garden, and Taxman. The main plot of the story is a reimagining of Robin Hood. When robbing from the rich Bender encounters the Rich family and Scrooge McDuck and his grand-nephews. Yoda, from Star Wars, is parodied as a crane operator. The uniforms used in the Holo-shed simulation resemble those from Star Trek. The name of King Richard the Linux-Hearted is a reference to Linux operating system and Richard the Lionheart. When Leela says that "Little Leela" sounds like a comic-book character from the 1950's, she is referring to Little Lulu. The end scene is a parody of Asterix comics. The screen on the telecommunication device on board the P.E. ship appears to have a crack in it while the crew is talking to the Head Fly. It should not work if it is cracked. This page was last edited on 10 September 2014, at 17:42.